The 2018 tax season is off to a slow start. According to the IRS, refunds are 8% lower than last year, and taxpayers appear to be taking their time filing their returns. But refunds will likely still run as high as two or three thousand dollars. 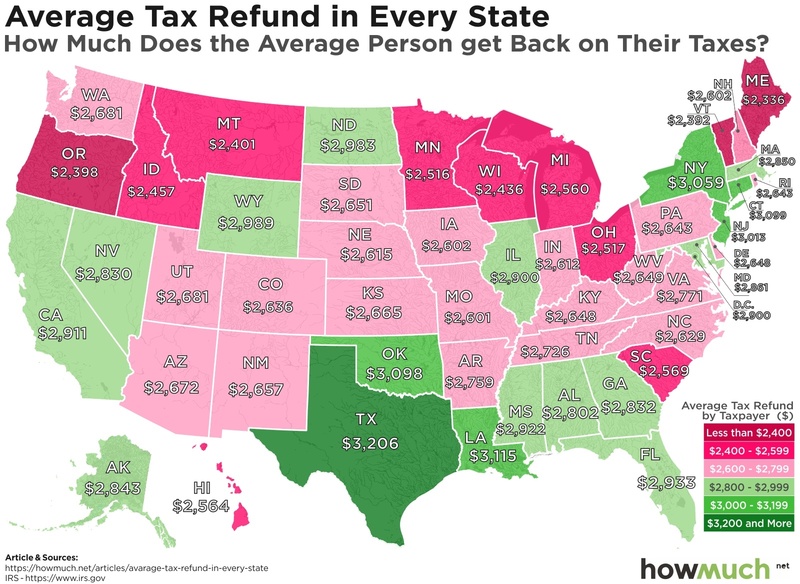 Exactly how big your refund will be depends entirely on where you live, a subject that our latest map breaks down in detail. The last day to file your 2018 taxes without an extension is Monday, April 15, 2019. The average tax refund is over $2,700, but the amount differs wildly by state. There are regional patterns in tax refunds, suggesting that conditions in similar states determine the size of refunds. Special thanks to Business Insider for collecting the data from the IRS. Keep in mind these figures are for federal refunds only from 2018. A lot of people also receive refunds from their state governments too, meaning there’s potentially a lot more money flowing back to taxpayers each year than even our figures illustrate. Even so, a lot can be said about tax policies just by looking at our map. First of all, there’s substantial variability in average refunds depending on where you live. Texans are in store for the largest refunds at $3,206, while Mainers are set for the lowest at $2,336. That’s a spread of nearly $1,000, enough money to make a real dent in credit card debt or start saving for retirement. We can also see some regional patterns in the average size of tax refunds. There’s a band of states stretching across the northern part of the country where average taxpayers can expect to receive relatively less than their Southern counterparts. In general, the further South you move, the higher your refund. There is an obvious exception to the rule in the Northeast, where high-tax states like New York and Massachusetts nevertheless enjoy sizeable federal tax refunds. There are lots of underlying reasons explaining these differences. The federal government has lots of different tax policies favoring specific behaviors, like owning a home, having children and giving money to charity. The Earned Income Tax Credit is an additional benefit for low-income filers that juices tax returns. If you are a childless renter who never gives to charity despite having a high-paying job, your tax refund will probably be quite low. To be sure, getting a tax refund feels like a windfall, but in reality it’s an interest-free loan that you’re giving the government. It would be much better to file your return and get a refund of $0, meaning you paid your exact tax liability, and nothing more, throughout the entire year. Instead of getting a nice check from Uncle Sam this spring, you would’ve had more money to spend throughout all of 2018.